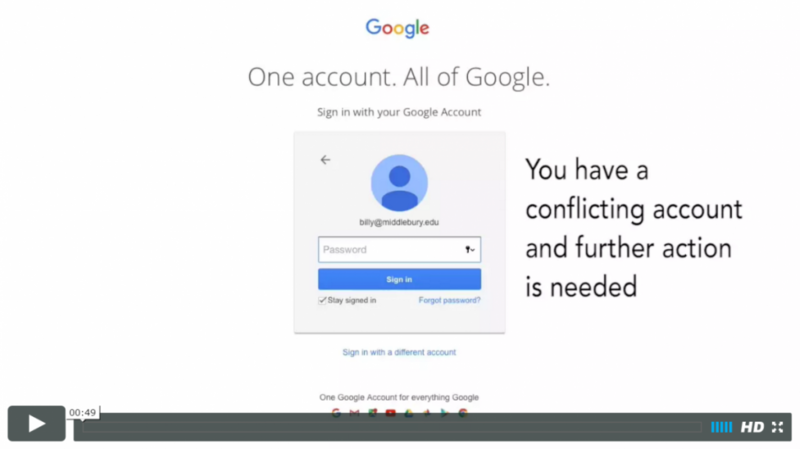 This video was created to help Middlebury network users check whether they had a conflicting Middlebury email account in Google’s system. It was sent out to students, faculty and staff in an email so that everyone could obtain his/her data before ITS synced Middlebury accounts with Google accounts. DMT Maggie Cochrane ’17 created it using Adobe Premier and iMovie with information provided by Middlebury ITS. “A quick note to express my gratitude to Maggie Cochrane for her expertise creating a video for us. It’ll be used to describe the process for determining if an end-user has a Middlebury managed Google account, or a standalone Google account. Without a way to educate the community on determining this, we couldn’t move forward on the project to sync all of the Middlebury users with our Google Apps for Education instance.